The tech industry is riddled with vaporware — those products that get a big public announcement, but never actually find their way to stores. And it’s always been this way. Just ask investors who were throwing tons of money at airship companies at the turn of the 20th century. Sometimes the people tasked with building the future get a little ahead of themselves. It’s one thing to have vision. But delivering on that vision and bringing a product to market is often a lot harder than it looks. Today we have a brief look at some of the most notorious vaporware to come out of the Consumer Electronics Show since it began in 1967. Many of these products would’ve revolutionized our relationship with technology. If only they weren’t too good (or sometimes too silly) to be true. Genus the robot was going to do everything: vacuum your floors, learn the floorplan of your house, play games, and work as a guard dog. Genus was even supposed to shake hands, provided you sprung for the optional “arms” package. Journalists at CES 1983 couldn’t say enough nice things about this futuristic Rosey the Robot come to life. Your personal household robot was finally here! Except that it wasn’t. Everyone thought that the 1980s was going to be the decade when domestic robots would finally invade American homes. But the 4.5 feet tall Genus, along with countless other robots of the 1980s, couldn’t make that vision happen. The company that built Genus — Robotics International Corporation of Jackson, Michigan — claimed that this futuristic wonder-robot would be in stores by summer of 1983. The cost? Anywhere from $3,000 to $12,000, depending on which options you wanted. Sadly, Genus never got the chance to wow us with its futuristic robo-moves. The technology never matched the hype. In the mid-1980s, most Americans didn’t yet have a desktop PC, let alone a portable one. But Commodore’s LCD was supposed to change all that. Debuting at CES in 1985, the 3-pound computer had a fold-up display that could handle a whopping 16 lines of text. This relic of the retro-future never saw the salesroom floor though. Commodore was reportedly scared off by the fact that portable computing was far from a proven market. Samsung’s Scoutabout robot was supposed to be the cutting edge of home security. 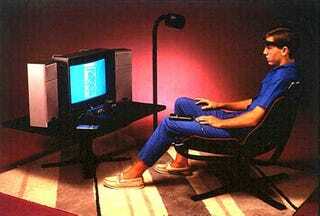 The product debuted in 1991 at the summer CES in Chicago. The idea was that the Scoutabout would autonomously roam your house every 20 minutes, looking for any sign of fire and burglars. Equipped with heat sensors, and microphones (which could reportedly detect the sound of breaking glass from 150 feet away) the Scoutabout was supposed to be one futuristic guard dog. With a retail price of $1,000, this Samsung robot was supposed to be available in February of 1992. It was never commercially released. What does the internet smell like? DigiScent’s iSmell was supposed to answer that question. This USB connected device made its debut at CES 2001, and was equipped with 128 different scents which could be mixed to create a nauseating hodgepodge of smells. Thankfully, the iScent never made its way into stores. As anyone who has mindlessly wandered the internet knows, one wrong turn can be quite an assault on the eyes. If the iSmell had become a reality, who knows what a nightmare it could’ve been for our noses. Everyone at CES 2010 was pretty excited about Qualcomm’s Mirasol displays for e-readers. As Andrew Liszewski put it, they were supposed to, “bridge the gap between LCD and e-ink display technology,” providing vivid color screens that could be read clearly in direct sunlight. Tech enthusiasts waited patiently for a couple of years until July of 2012, when Qualcomm finally announced that it had shut down the project. Their tablet dreams are dead, but the technology is still fighting on life support in smartwatches now. Startup company Skiff showed off its flexible touchscreen e-reader technology to much fanfare at the 2010 Consumer Electronic Show. “Kindle and Nook should be scared,” Dan Nosowitz wrote at the time. But not long after its coming out party, Rupert Murdoch’s News Corp. bought the company’s software, leaving the revolutionary hardware to rot on the vine. After filing for bankruptcy for a second time in 2008 (the first was 2001), Polaroid looked like it was finally going to die. But a group of buyers thought the Polaroid name was so valuable that they purchased the brand in 2009, leading yet another attempt at updating the deeply wounded company. Part of their reboot was hiring Lady Gaga as a creative director, and in 2011 making a big splash at CES with the promise of a signature gadget: the GL20 Sunglass Camera. But alas, the camera-and-display sunglasses never saw the light of day. The retail plans are still being developed as we complete product development. The GL20 Camera Glasses are a unique product and blend of technology and fashion and Polaroid will release them when they feel that all aspects are perfect; up to Polaroid and Lady Gaga’s very high standards. We will share additional details once more information becomes available. Who knows, maybe they’re still working on it. Let’s all hold our breath until it comes out. Full disclosure: In my former life as a “non-traditional marketing” grunt, I briefly worked on a project for Polaroid’s PoGo Mobile Photo Printer in 2008.